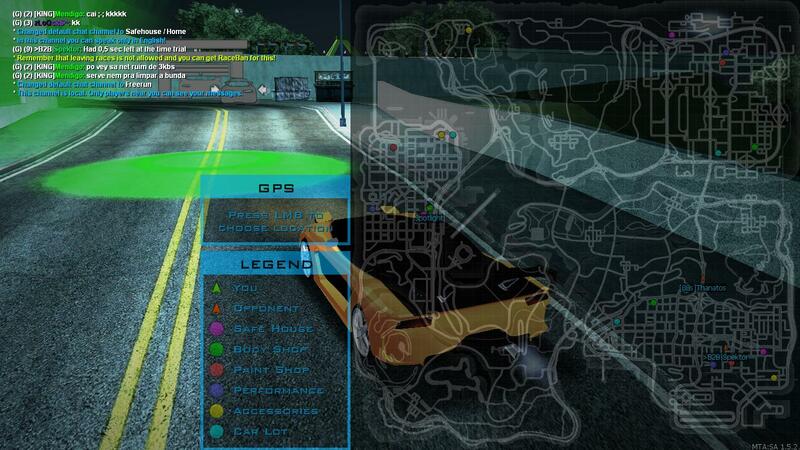 Need For Speed: San Andreas is literally NFS in MTA. 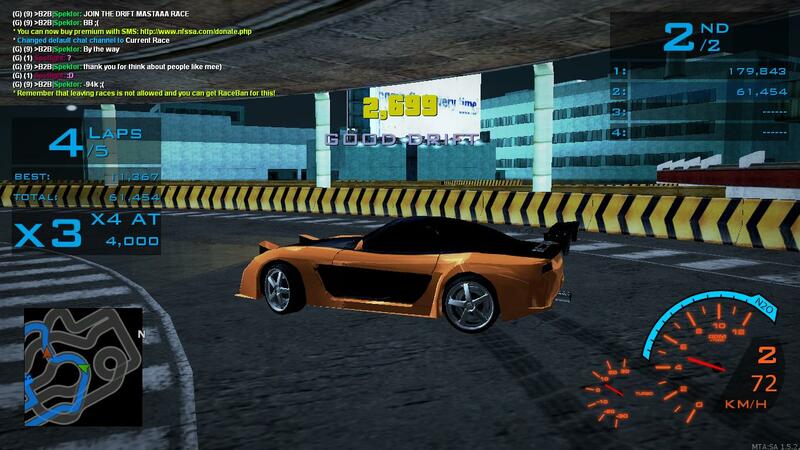 It's an advanced gamemode based on NFS UG/UG2. This is your garage. 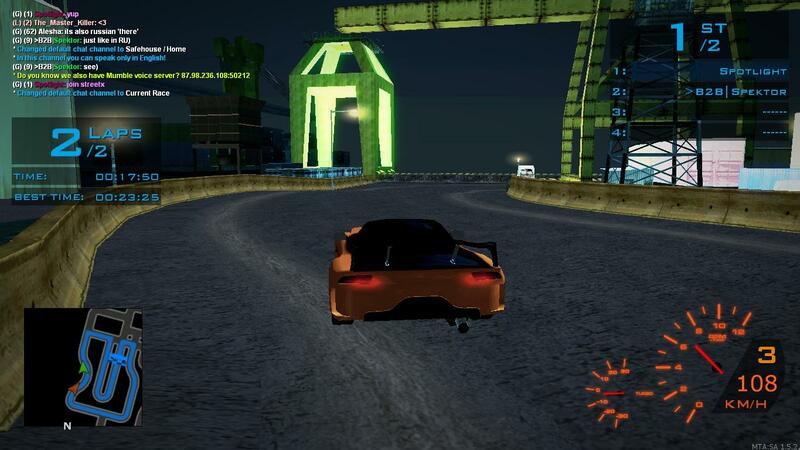 From this place you sign up for a race, go freerun mode where you can tune your car, hand out with your friends and other players, change your car to any other you have already bought, check your statistics and server rankings, check your car's current progress and change settings. Sprint races are simply one lap races from one point to another. First on the finish line wins. Circuits are pretty much like sprints. They just have more laps. Our drift system is based on our own drift script. Brand new handlings, score multipler and critical zones. Drag system is something completly new. It's just like in UG/UG2. Drags use manual gear shifting. 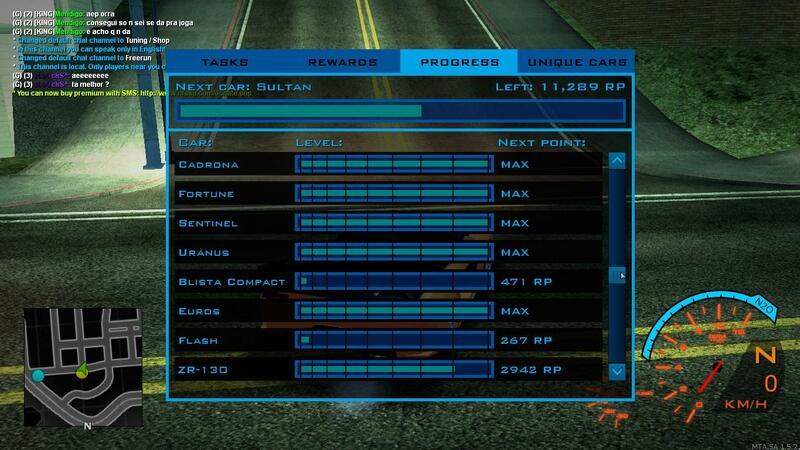 Drag objective is to shift your gear in best rpm moment. You can change your gear too early, good, perfect or too late. How you change your gears is really important during race. Street-X races are short circuits on drift maps where you cannot use nitro. Freerun mode is a place where you can tune your car, hang out with firends or other players. There are five different type of shops. Body Shop, Paint Shop, Performance Shop, Accesories Shop and Car Lot. Body Shop let you customize your visual tuning. You can change bumpers, add a spoiler, change your rims. To unlock such things like bumpers, bodykits or spoilers you need Body Points. They are earned randomly after races. Paint Shop let you customize an appereance of your car. You can change color of your car, your rims and add stickers or vinyls. Performance Shop let you customize your performance. There are three different types of performance tuning: engine, handling and acceleration. Every pack has three stages: Street, Race and Pro. You can upgrade your performance after earning enough reputation. Accesories Shop let you add neons, color of your lights, windows or change your current speedometer. In Car Lot you can buy cars you have already unlocked. You can also go back to your garage by going to Safe House. If you want to change your spawn location you can go to any other Safe House and next time you will spawn there. Progression is based on reputation points. Reputation points can be earned from any kind of races. Next car bar shows how much reputation do you need to unlock new car. Bars below shows how much reputation do you need to unlock next performance package. There are two different type of tasks: Global and Daily. 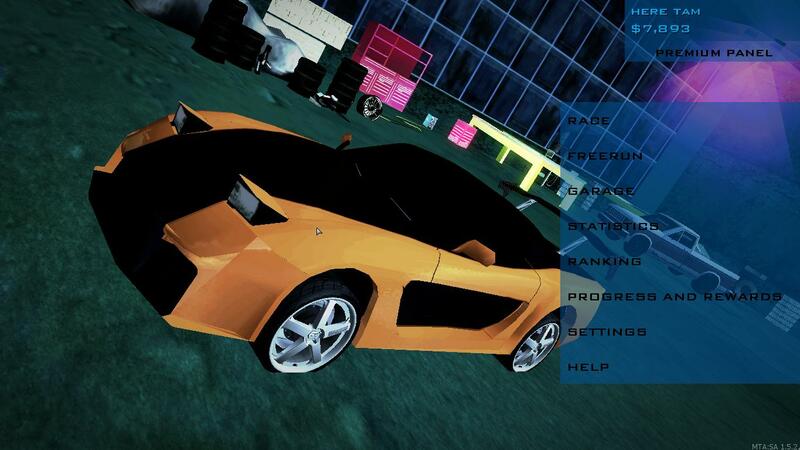 Global tasks are simply tasks which you complete during races or freerun mode. Every global tasks is rewarded with Task Point. Daily tasks you can do only once a day and they are rewarded with Vinyl Points. Rewards tab let you unlock different things with Task Points and Vinyl Points. 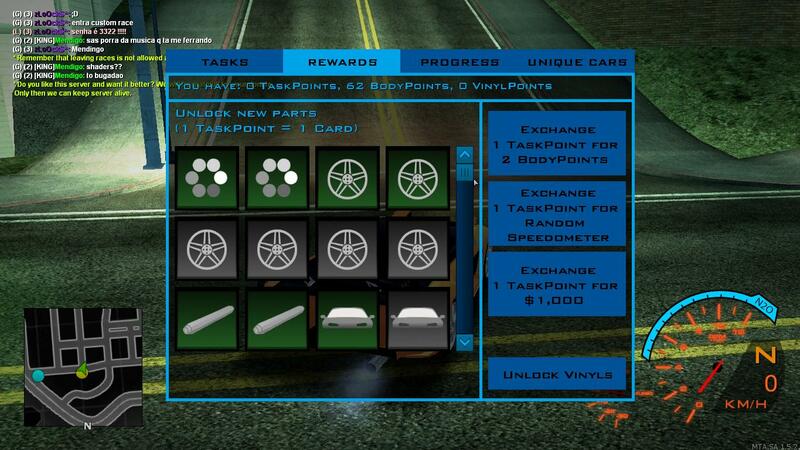 Every task point can be exchanged for a Card, 2 Body Points, Random Speedometer, 1000$ or a Vinyl. What's in Cards? Different paint types: Metallic and Matte. 6 types of rims, bright and pulse neons, dark and pearlescent windows, bright lights, additional vinyl layers, roof scoops or carbon parts.Vinyl Points can be exchanged for new Vinyls. Classes E to V are accessable with Reputation Points. Class U stands for unique. There is different unlocking system for Unique Cars. To unlock them you have to find 10 parts of these cars. There are 50 different part spawns for each car which is completly random for every player. 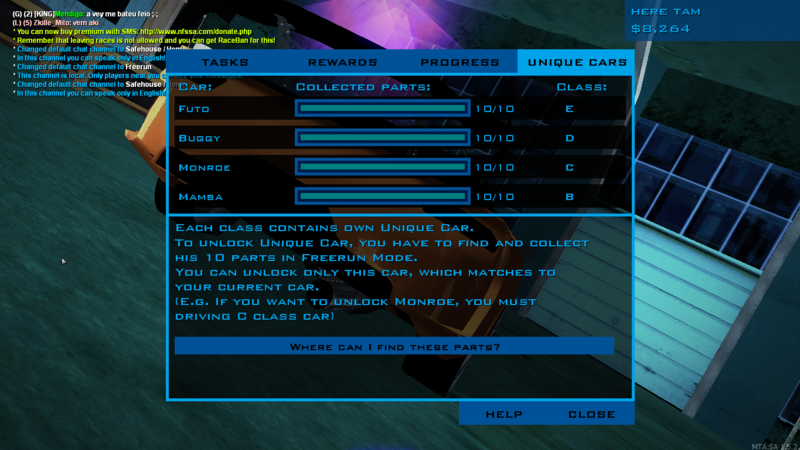 You can find a parts map in Unique Cars tab in Progress and Rewards. Web user panel is completly new feature. You can link your in-game account with website account in order to use some extra features. You can check your driver's statistics, check your friend's statistics and rankings. 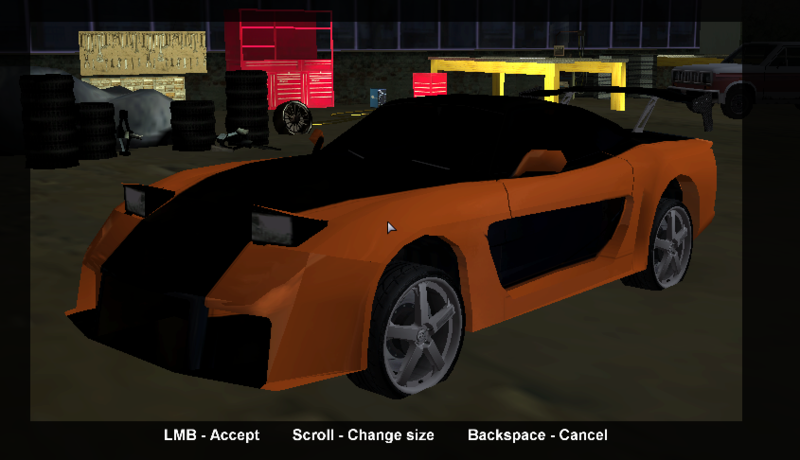 In-game garage lets you update your car's photo, which you can view later on website. You can also check other people's garages, check their cars and progress. Introducing brand new feature - Beginner Bonus. This feature will help new players with reputation and cash. We have also reduced requirements for each car in order to make this game more casual friendly and less about grinding. 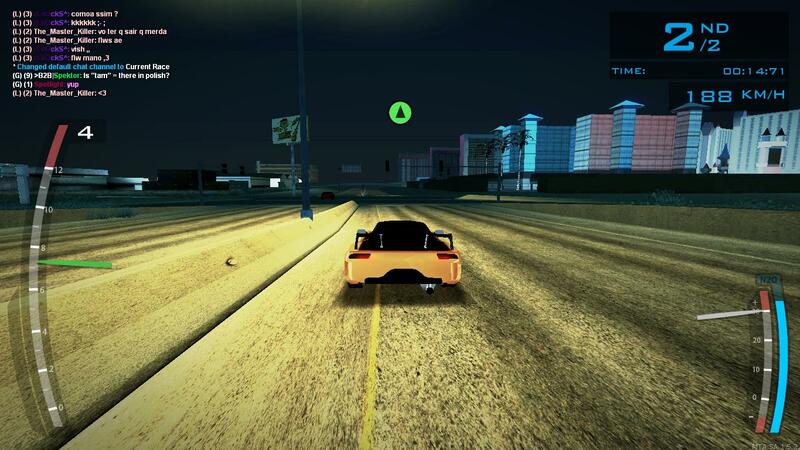 See you soon in Need For Speed: San Andreas.. This can be helpful. But most of beginners won't look here. This tutorial needs to be updated. The server has Class A cars now.